Barbara Baron – Building a healthier you one meal at a time. Are you ready for a healthier you? Start Building a healthier you –One Meal At A time™! It’s not easy eating healthy. For many of us, nutrition often takes a back seat to juggling the demands of family, work and life. The idea of pulling together a balanced meal can seem exhausting — or just plain impossible. That’s where Barbara Baron comes in. For more than 30 years, I have been helping individuals, families, employers and health care professionals realize the benefits of healthier food choices. I am a Registered Dietitian Nutritionist (RDN) with special training in pediatric nutrition, weight management for adults, adolescents and children, cardiovascular health and nutrition, and business communications. Now Barbara is ready to put her considerable nutrition expertise to work for you today! I work with busy parents, juggling the needs of teens, aging parents or both. I will help make you the family’s “Hero of Health” in this “sandwich” generation! 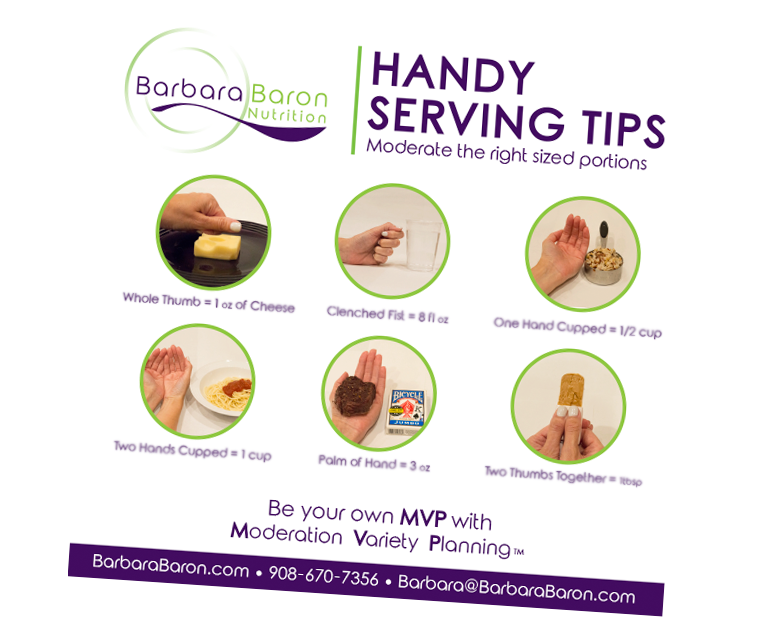 FREE Handy Serving Tips Download! 6 ways to easily measure serving sizes! Sign up for my Tips & Tricks Newsletter and I will send you these foolproof tips to help you stay trim! Barbara will work with you to develop a Personal Action Plan based on her signature “MVP” Program. MVP stands for Moderation, Variety and Planning, and it’s the foundation for tasty and nutritious family meals! Start building a healthier you — one meal at a time™! Associations and organizations of all types can reach out to Barbara to help improve their employees’ health and wellness. These types of programs are more important than ever, and Barbara’s Keynotes, Workshops and Workplace Wellness Programs are an ideal way to stay on top of the latest trends. She can help your employees make smarter food choices to keep them healthy, happy and productive. Barbara Baron works with people juggling the demands of health, family and work so they have far more energy, time and family fun!